Provide comfort for the family of Barbara Rozdziabek with a meaningful gesture of sympathy. 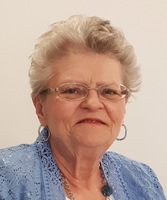 On January 26, 2019 Barbara Rozdziabek of Vegreville passed away at the age of 71 years. Barbara is survived by her husband of 53 years, John; daughters, Audra Zyla (Kevin Kropielnicki), Carrie (Jim) Douglas, Sandra (Tim) Boonstra, Jacqueline (Marvin) Kachuk, and Andrea (Mark) Lee-Wing; twelve grandchildren; eight great-grandchildren; two sisters, Tammy (Dave), Shirley (Paul); one brother, Ken (Bernie); also numerous nieces, nephews, and other relatives. Predeceased by her parents, Ed and Mary Koluk; brother, Jack; and son-in-law, Ron Zyla. Celebration of Life Friday, February 1, 2019 at 2:00 p.m. at Vegreville Social Centre, 4802-47 Street with Eric Berge officiating. In lieu of other tributes, donations may be made to the Homestead Lodge in honor of Barbara. Our sincere condolences to the family. Barbara was a very special person dedicated to her family and her lodge family. See will be missed. Rest In Peace Barb. Out sincere condolences to the family, Barbara was a very special person very dedicated to her family and her lodge family. She will truly be missed. Rest in Peace Barbara. I am sorry for your loss. I met Barb when my Mom and Dad John and Rose Skoropad stayed at Homestead Lodge. Our family appreciated the care that they received from Barb and staff at Homestead. We are so very sad to hear of your mom’s passing. Barbara was a very special lady and will be missed by many. Michelle has such fond memories of hanging out at the Rozdziabek house with Audra and just having fun. Your family is in our thoughts and we send big hugs to you all. Michelle, Shannon and Shaun Haubrick.